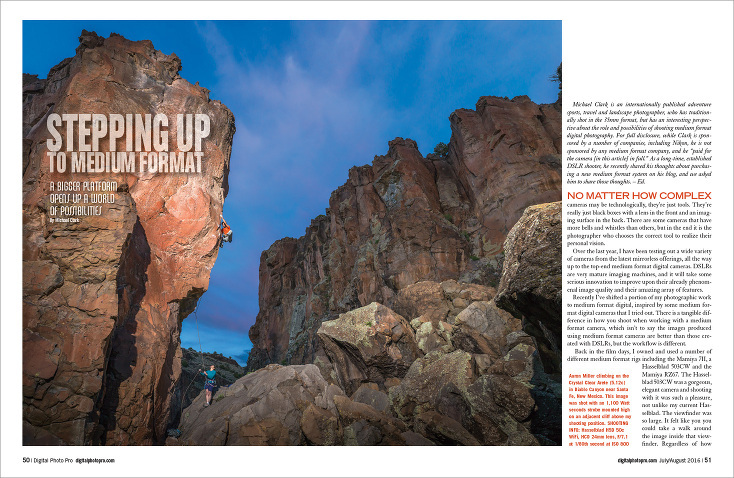 In the July/August issue of Digital Photo Pro, which is on newsstands right now, I have an article entitled, “Stepping Up to Medium Format,” which details my adoption of a new medium format rig. As is made clear in the article, I have not converted 100% over to medium format capture. I still use my Nikon DSLRs for the majority of my work but I have added the Hasselblad H5D 50c WiFi kit along with four lenses for those situations that don’t require wicked fast autofocus or lighter weight cameras. Above and below are a few screenshots of the article as it appears in the magazine. If you are interested in medium format, especially now that Hasselblad has announced the X1D, I highly suggest picking up a copy of Digital Photo Pro. Along with the article, Digital Photo Pro also included a healthy number of images to show the wide variety of action, landscape and lifestyle images I have produced in the six months that I have had the camera. I have to say that in such a short time I have already produced some amazing work – work that I look at and really love, which is not always the case with my own images as I am a very harsh critic. I will be shooting quite a bit with the Hasselblad in the months to come and will be posting that work on my website and also on Instagram. At some point here I will make some huge prints of images captured with the H5D and also with the Nikon D810 and do a comparison. My thanks to Digital Photo Pro for publishing this article.